ALM, requirements engineering, agile development, system development, software, uml, sysml, application lifecycle management, development management, requt. The reality of software and system development is not always easy, it can be hard to elicit requirements. objectiF RPM is a great help. 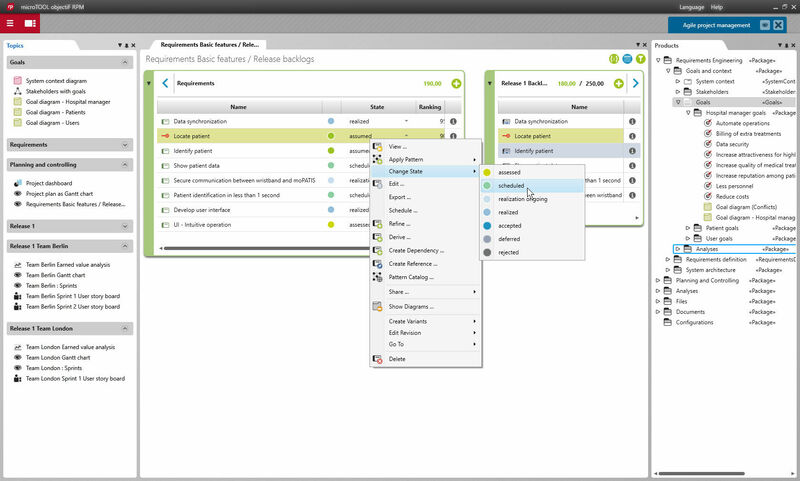 Software for Application Lifecycle Management. It combines model-based requirements engineering and management, system design, agile and classic project management approaches and agile testing in one solution. The tool offers visual requirements analysis and specification (use case modeling, block diagrams, class diagrams, package diagrams, requirement diagrams with UML, SysML etc.) form-based documentation of all requirements (with editable states, priorities and workloads as well as interdependencies between requirements and other system elements). Task and project planning can be done the agile, classic or hybrid way and are derived straight from requirements. objectiF RPM offers a roadmap for release planning, Gantt Chart scheduling, cost and progress control, import and export of MS Excel files as well as ReqIF and JIRA interfaces. All project results are traceable all the time thanks to integrated configuration and variant management. Current reports for project controlling can be created at any time with the help of dashboards, queries and views. The software offers a common environment for team work via client-server or web-client access. A tool of the newest generation: scalable, integrative, adaptable and extendable with modern architecture. ment within objectiF RPM, you have the option of scaling projects with one team to projects with many decentralized teams. Create CD DVD presentations, brochures, catalogs, CD menu; protection. The user simply inserts the autorun/autoplay CD and Web-like pages are shown. All visual, no programming: automatic catalog creation w database import; auto photo album and more. Pricing and Breakeven Analysis, test price changes, determine optimum pricing to maximize profit, and calculate breakeven points. Easy to use input with tabluar and graphical outputs. For new or established businesses, products, or services. The blueshell Data Guy is an ADO-based editor for virtually all types of databases. This program supports Jet (Access, dBase, Paradox etc. ), Oracle, SQL Server, MySQL, Sybase, other OLEDB and ODBC providers, Cut and Paste, Drag and Drop, Explorer..
A client manager for tarot readers. Includes client database, email, printing and many more features. View and Synchronize Microsoft Access, Excel, Oracle, Foxpro, dBase or any ODBC enabled database with palm.Add, Delete, Modify Database records on palm.Get updated desktop data on palm and palm data on desktop automatically.Export records to MemoPad.